Have you ever had a session stall on you? If so, describe the situation and how you overcame it. "I Am A Plot Nazi!" In my experience, minor NPCs are best roleplayed with a single, defining quirk or stereotype -- a posture or mannerism, a physical trait, or a manner of speech. The last is the most memorable for players. These characters need to stand out quickly, and need a sort of roleplaying shorthand so the DM can make the characters quickly identifiable and create a quick sense of individuality for the characters. A quick quirk and a good name are perfect ways to make a character stand out. An example, from a friend's Werewolf game, was the head of a pack of Bonegnawers living as transients under a bridge. The pack leader was simply known as One-eye. All we ever saw of him was a single rheumy eye in a bundle of blankets, and he spoke to us in a gravelly voice, then usually disappeared into the Umbra after talking to us. He always had a real and distinct presence in the game. Slurred speech or perfect enunciation. Next time you're watching a show or reading a book, focus on the servants instead of on the main action. Look at their mannerisms, roles within the story, behaviours, and thought- processes. Immediately afterwards, write out a servant NPC profile or two (with basic or few statistics for now) based on what you saw or read. Note specific quirks, traits, and behaviours that stuck out in your mind and made the character memorable. Then, when you have the time, flesh out the minor NPC with skills, ability scores, and other game rules that you might play with. Charles S. wrote in with a great example of a TV servant, which inspired Tip #2: Radar O'Reilly from the show M*A*S*H.
Personality: Shy, competent, kind, nervous, obeys the rules. Mental: Competent, organized, becomes agitated when his routine is broken. Memorable quirks: Seems to know what's going to happen a moment before it actually does, looks after several pets and talks to them like they were real people, has a distinctive giggle. You could then either turn this into an NPC for your game, or split up the traits and ideas over several different servants and just use the TV character for inspiration. Figure out what the servant is up to in the short term, fitted to the time span that the servant or other snapshot NPC usually works with. Also consider what the NPC is thinking while in contact with the PC. Someone's plan might be to get the next high by any means necessary. Another might focus on sterling service. Another might not care much about the job, but think of his child and sick spouse. Whatever it is, it is the foremost thing in the person's heart and mind at the time the PC is there. Where would the person like to be in the future, in the longest time span relevant to the NPC? The one focusing on sterling service might picture himself as the owner of the establishment eventually, with a fine lady and a house with a white picket fence. The junkie may have no dreams other than death.. or perhaps he dreams of a great high, or perhaps a drug free future where he's the pusher rather than the addict. Minor NPCs, particularly servants, tend to be invisible, part of the background, blending in and becoming a simple element of the story. After all, good servants are supposed to be just that: unobtrusive, loyal, respectful, servile, experienced and competent in their line of work. Most of the time, it shouldn't be necessary to play a proper servant beyond these basic traits. In fact, trying to make every NPC, particularly minor NPCs, distinctive removes the impact of the DM's efforts to make their major NPCs, such as villains or allies, distinctive. The DM often runs out of good material before a main villain gets introduced in the latter half of the campaign, and so there's little that will be uniquely distinctive about him. The DM describes how well the NPC is doing his job, and makes it almost a running gag. The DM mentions or focuses on one aspect or trait about the NPC that sticks out. The valet who congratulates the warrior immediately after a combat ("Bravo, Sir! Bravo!") and then offers to clean his master's weapon. This valet is ever-present, no matter how much danger his master places himself into. The ever-prepared butler who has everything his patron requests, as well as whatever the PCs request, at any moment. "I just happened to have that antidote right here, Sir. Perhaps with a spot of tea? Which spellbook would you like to read this evening, Sir?" He's the kind of guy that makes the PCs ask themselves, "Where does he keep it all?" The self-effacing servant who continually apologizes for 'the unsightly mess' in the spotless manor, and does so in a genuine and almost fearful manner. Their groveling sometimes makes more friendly characters feel guilty for invoking such a response. The stern assistant who keeps everything scheduled and orderly for their master, always interrupting with a remark about their busy schedule. "Excuse me, sir, but that week, you've already committed to join the Baron in a dragon hunt. The week after? I'll make a note for you, sir." This is the guy that keeps everything in order for their patron. Everything. Alternately, a DM can focus on a physical, mental, or behavioral trait that makes the NPC stand out. It is best to limit the NPC to one distinctive trait, simply to allow the major NPCs to stand out. However, if the DM so chooses, they can add more, preferably following the old adage of 3-5-7. Distinctive and descriptive comments should occur in odd numbers, such as three, five or seven, as they will tend to stand out more in memory. Dedicated to a particular religion, military order, guild, or organization, complete with secret handshakes, special meal observances, and the whole bit. Finally, the most important note regarding making servant NPCs distinctive is to be consistent. Take notes of your NPCs, their names, their role in their society, and that one distinctive trait. If the DM can consistently present their minor NPCs, it adds to the suspension of disbelief that allows a good game to become great. PCs can quickly become creatures of habit, and a consistent environment allows the DM to lull the PCs into a certain sense of security. Then, the NPC can be used to make the world become a bit more alive. They could get married, be kidnapped, make enemies, introduce new allies and patrons, spread rumors, etc. In short, a well-played servant NPC can flesh out a world and contribute to the overall enjoyment of the game. 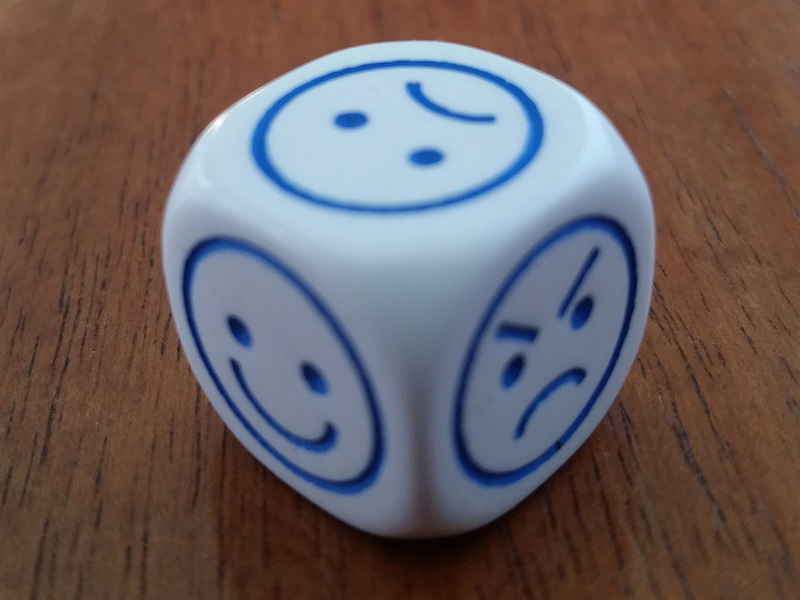 One recent addition I've made to my games is a mood cube. It shows six moods that I use on NPCs: really happy, somewhat happy, really sad, somewhat sad, angry, and ambivalent. I don't use it as a reaction die, but rather as a general mood die for random NPCs before they are encountered. With only six faces and limited emotional states it has to be used with a light hand, not adhered to slavishly. One person in six you encounter is hopping mad? I would hardly think so. It can also be used as a classic decision maker. As in the quote: "If you don't know what you want, flip a coin, you will know before it lands which way you want to go." So if I roll a "mood" I think is wrong, it should be *that* way, I go with that way, because that is what I wanted, even if I didn't know it. Also, it's one more random and unknown factor on the GMing table. I play with the dice all the time, on an open table, where my players can see. Better than half of those dice are determined by me, and unknown to the players as "play dice", they never make a serious roll. But I roll them around the table all the time with the "real" dice. Was that move the GM fiddling with the dice again, or something real? They never know. Garry S. mentioned this little deception in an email to me: "The trick, as I see it, is to [create interesting minor NPCs] regularly enough so that the PCs don't pick the important NPC out at once. It give some color to the otherwise colorless, faceless masses." I think that this is a great idea for you to use from time to time in your stories. It can help foil meta-game thinking and make your game world more believable. Another matter is the servants within the party of PCs. If they have such, use them. Comic relief is a good use to put party servants to. There was the Squire that could get a shine out of felt. The transformed magician's apprentice (a donkey) that had the "Eyore" complex. ("It doesn't matter, we're doomed"). Servants should never be "important" or take attention away from the party, but they can serve to break the tension, and occasionally impart information ("Hey boss, that guy dropped this, is it important?"). Once in a great while you can kill one to make a point, taking the shot for the master for an assassin that "just missed". However as said, use this very lightly. The first job of a game master should be to completely immerse themselves in their own creation. One way of doing this is to create a catalogue of details from the perspective of a hypothetical character, a 'Godot'. This Godot could be someone that the player characters (or their servants, hirelings, operatives or family) hear about, imitate, clean up after, or whatever, but in the process of charting the earlier character's "offstage" progress one is also creating a channel that runs through the game world. If Godot had a servant or slave, what race or class is the servant? And why? Can such servants be obtained by player characters, or are the PCs themselves to be servants of a greater person, power or organisation? Where did Godot wander abroad? When servants and commoners swear by something or someone, who is it? And why? What are the laws for mistreatment of servants or slaves? If a player character is a servant, do they get identical benefits or disadvantages to an NPC servant who is also in the campaign? Is there a default reason for being a servant, such as pennilessness, apprenticeship, or religious discrimination? When roleplaying servants, I always try to remember one thing about them: they are gossips. Players realize this when their characters are seeking information, but they often forget it in regards to the information NPCs gather about THEM. Even NPC hirelings, ESPECIALLY NPC hirelings, gossip about their employers with servants from other households. I routinely keep a list of important info the PCs let slip in front of servants. (And being a 7th Sea GM, I hasten to point out that UNOBTRUSIVE is an actual servant knack in that game system -- and probably should be in ALL systems.) This is information that could potentially wind up in the wrong hands. And, whoever it is the PCs bribe for info on Bad Guy A is also already thinking about how much Bad Guy A will pay to know that the PCs are asking about him. Players (and DMs) often forget that gossip works both ways. Players know to pick servants' brains when THEY want info, but they often forget the servants are also picking them for info to spread to OTHER sources. This is an example of what I call "invisible roleplaying"....things that go on that the players never see. 1st. Find out what your players want in a roleplaying session - and give it to them. I know it is rather obvious - but even after more than 15 years of GMing I can still occasionally forget it. Some people love straight out combat, others prefer detailed descriptions of what they see. Some want dialog, politics or intrigue. Some love getting the most out of the rules, and others are just after a laugh. It is not easy to cater to everyone - but I find they generally appreciate it when you try. 2nd. Make sure you also enjoy yourself. 3rd. Take the time to prepare. No need to go overboard - but a disorganised and fumbling GM can quickly turn the mood of a game. Goblins are, by far, the best monster out there. No matter what you all think, goblins can beat dragons. Goblins are evil little buggers that, unless you kill the village and stab every single one of them, next year you have a new horde of goblins. Now, unlike what most people think, goblins are pretty smart. They're not rocket-scientists, but they're not dumb. Traps. Goblins can use all sorts of simple traps, pits, pits with spikes, spikes, trip lines, crossbows, whip-lash trees, animals. So let them. Goblins are light, so a goblin can stand on the top of a pit and when the adventurers come, it runs off the pit and the PCs fall in. Goblins will never enter a fair fight. They will ambush, run, use their size to hide, and then fire another time till the party is too weak and THEN they charge into combat. They're not dumb, they can tell a mage from a fighter, they know to kill mages and clerics before shooting at dwarfs. They can have shamans, clerics, druids and mages. Let them. There's lots of 'em. You can kill 5 and there are plenty more to fight. No moderately powerful party of PCs will ever expect to be attacked and hurt badly by goblins, so use them. They're cheap, it's easy to get more, and they're very expendable. Goblins can be well organized but they are easy to repress, so bigger things could force goblins to fight, and if they have time and the equipment, they could make a death trap for a dragon. So, never underestimate goblins, because your PCs will. Last, in one of the old D&D monster manuals, there was a variation of goblin (I forget its name, but they were the same except that they could only be hurt by heal spells due to some magic experiment that created them), so 1-5 of those could make the PCs' heads spin. "There are all kinds of gamers here. A lot of people play Vampire: the Masquerade (in their own way :P) and other White Wolf games like Werewolf: the Apocalypse, or Mage: the Ascension (these are the ones that got translated here). Another bunch plays the local games released by local publishers: some that are just another version of the "pseudo-European pseudo-medieval" type, others that are mystical/horror contemporary scenarios, and the never ending Anime adaptations (that are awful, in my opinion) from the only RPG magazine that exists here. And this magazine is almost becoming a "one system" publication because the publisher has its own system (which is very popular here, especially among the younger audience, 'cause it's cheaper than an average book). Some time ago there was a system/scenario that was about a truly Brazilian setting: it was about the time of exploration of the "new land" (about 500 years ago when Brazil was "discovered"). The mix of local folklore and historical references was good but... the local RPG market was still growing (and not that large) and this game was cancelled, among others. There is another attempt to make a "contemporary local setting" but I think it's just "World of Darkness" with another name. :P My opinion. The majority of players here are teenagers but there are some people that have been in the hobby for some time now. And most of the players here limit themselves only to the material that's been translated."